FILE - A Pakistani soldier stands guard at a newly erected fence between Pakistan and Afghanistan, at Angore Adda, Pakistan, Oct. 18, 2017. Pakistan says that almost 92 percent of its 2,611-kilometer largely porous frontier with Afghanistan will be fenced by end of 2018, hoping the massive unilateral undertaking will effectively address mutual complaints of militant incursions. The military-led construction effort went into action earlier this year. It has already fenced off about a 150-kilometer portion of the border identified as “highly prone” to terrorist infiltration. The pair of nine-foot wire fences, with a six-foot gap, and topped with barbed wire, runs along rugged terrain and snow-capped mountains as high as 12,000 feet. Officials estimate the project will cost about $550 million. “Our target is to complete it [the fence] by end of 2018,” Major-General Asif Ghafoor tells VOA. He explained the plan intends to cover up to 2,400 kilometers of the entire Afghan border because the rest cannot possibly be fenced. Additional outposts and small forts are also being built and being equipped with high-tech surveillance systems to enable soldiers to monitor and detect intrusions around the clock. “And on the average, every 1.5 to 2 kilometers will have physical presence [of our soldiers],” Ghafoor said, adding the army has also recruited tens of thousands of new troops for the deployment. 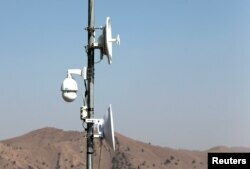 FILE - Electronic surveillance equipment is seen along the border fence, outside the Kitton outpost on the border with Afghanistan, in North Waziristan, Pakistan, Oct. 18, 2017. Afghanistan opposes the fencing project because it historically disputed the colonial-era demarcation drawn up by the British in 1893. Kabul insists the barrier would add to problems of divided families on both sides. Islamabad rejects Afghan objections and is pressing ahead with the border fencing, insisting the project is critical for national security and for promoting peace and stability in Afghanistan. Afghans have long accused Pakistani security institutions for sheltering Taliban insurgents and the Haqqani Network of terrorists staging deadly attacks in Afghanistan to allegedly prevent rival India from increasing its influence in the war-torn country. For their part, Pakistani officials say anti-state militants after fleeing security operations, have taken refuge in Afghan border areas and plot terrorist attacks against the country from those sanctuaries. Relations have deteriorated between Afghanistan and Pakistan over terrorism allegations against each other. Ghafoor said that military-to-military coordination has improved since the Pakistani army chief visited Kabul in October and held detailed talks with President Ashraf Ghani. “We have shared through [our] Foreign Office a comprehensive action plan document with Afghanistan and subsequent action on this plan will lead to further improvement,” Ghafoor added. 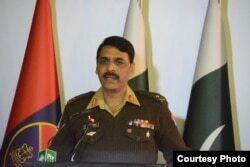 FILE - Major-General Asif Ghafoor holds a press briefing, Dec. 27, 2017, in this his handout picture made available by Pakistan's Army's media wing, ISPR. Islamabad shared with Kabul last month what it called an “Afghanistan-Pakistan Action Plan for Solidarity" (APAPS) for a “constructive and meaningful” engagement between the two countries. The proposed plan would create working groups in politics, economics, the military, intelligence sharing, and issues related to Afghan refugees in Pakistan. Ghafoor said no anti-Afghanistan sanctuaries are present in Pakistan following major counterterrorism operations in the past three years. But he complained that a large number of Afghan refugees in the country are blocking efforts to completely eliminate the threat. “I can assure you the day these 2.7-million Afghan refugees go back to their country, our liberty of action will expand to trace the left-over facilitators and abettors,” Ghafoor said while responding to U.S. criticism of Islamabad’s “inaction” against insurgents using Pakistani soil for attacks inside Afghanistan. The army spokesman said investigations in connection with recent terrorist attacks in Pakistan have led officials to conclude that planners were located on the Afghan side of the border. Many of the would-be suicide bombers authorities have recently arrested in Pakistan are Afghans, he added, without giving any figures.